[Server thread/WARN] [minecraft/MinecraftServer]: Can't keep up! Did the system time change, or is the server overloaded? I have been playing this pack for a while with a buddy of mine. I host the server on my PC and join it myself. It hasn't been an issue at all until now since my PC is a beast and my connection also has enough upstream to not be an issue. The warning/can't keep up message happens more and more often and tonight it was worse than any time before. I hosted the server from my PC as normal and connected to it from work and my buddy connected like normal. It was unplayable. Does anyone know what to do to fix this? EDIT: Also it's v3.50 - updated the server a few days ago from 3.42 with no problems. What? That makes no sense, sorry. I saw Direwolf20 play and he had to fight the dragon. So now experience vary from one machine to the other? Really weird. Im stuck with a quest involving an undocumented block that doesn't work as the questbook says. The Antimony quest says that I need to place an alchemical recombulator on on the top side of the mixer centrifuge and add pedestals. I did that, I have molten sugar and molten lead in the centrifuge, I have the five pedestals with aspecti and ashes, but nothing happens. I tried shooting ember at the mixer centrifuge, I tried shooting a bean of energy (with the bean cannon) at the recombulator, no effect, nothing happens. The block is not documented anywhere, not in the Ember book, even searching on Google gives nothing. Maybe something got changed because of Embers replaced with the Rekindled version. Anybody else had issues with this quest? I have to the following strange problem with this modpack. With a fresh installation of 3.5 with a fresh new world on a server (linux x86_64 - Core i7 - 32GiB RAM) or on a client (windows x86_64 - Ryzen 7 1700x - 32 GiB RAM) one CPU core is always at 100% (even with 12GiB of RAM assigned - so GC shouldn't be that much under pressure). Anyone else having the same issue? Or is this behaviour considered normal for this modpack= (I don't know of any other modpack having the same behaviour). EDIT: After some investigation we found out it has something to do with galacticraft background world mapping - after a while the cpu usage went down to normal levels. Still struggling with that. I aligned my setup with what I saw in some videos, tried different placements of the alchemical pedestals, nothing happens. I have 1920 mb of molten lead and 960 mb of molten sugar in the mixer centrifuge, there is 2120 ember in the centrifuge, the alchemical recombulator is hooked up to the side of the top block, I tried to break and replace the recombulator countless number of times, I have silfer and dawnstone aspecti on the pedestals just adjacent to the recombulator, I put 16 piles of ashes in each, nothing, no alchemical waste, no antimony. I'm attaching a picture of my setup in case it can help figure out if something went wrong (I really hope to be wrong and find a way out of this). At this point, my only hope is to get a signet of antimony from a villager trade, not sure it's even possible. If it is, maybe the Amadron tablet would display that trade at some point. Being blocked by a non-sense quest is very frustrating. I'm more and more considering the possibility of removing the gamestages mod to stop being blocked by it and the BQM mod as well because it often requires hackery with bq_admin, and I really dislike that. I saw many many times Youtubers like Hypnotizd and Direwolf20 tweak with bq_admin to work around broken quests. If quests cannot be tested, there should not be quests and the progression should around the crafting of items (maybe with tweaked recipes). Not sure what to do now. Yes I could do all sorts of other quests in chapters not depending on Embers completion, but I'd like to get AE2 as soon as possible, and Embers is in my way. From past experiences in other games, if I need to start cheating items or bypass parts of the progression, this goes on and on until the end; things continue to break and become harder and harder, requiring more and more cheating. Was buildcraft everything removed in 3.5? I saw an issue just opened on it in the issue tracker, but I'm not sure how to bridge the gap where you would use bctransport normally other than just "tough it out" until you get to real pipes of some other variety... which is a staggering distance away in gated mode (esp for power). I didn't know this got removed. Indeed, piping is quite weak in this pack when playing in staged or gated mode, until you get to Mekanism. I found no energy pipe from BuildCraft, so first power transfer I got was through Immersive Engineering cables. For items and fluids, without BuildCraft, you pretty much have FactoryTech and Immersive Engineering. Item conveyors are pretty horrible when you have a ring of magnetization so I ended up using chains of hoppers or ESDs. I was reflecting about pre-AE2 crafting helpers and could come up with these. Which one would be the best? The worktable may be particularly useful, capable of memorizing recipes. There could be one such worktable per mod, to help (re)crafting basic components. Thanks for the suggestions, I'll dig around try to race for mekanism or IE. FT is one of the most miserable mods I've ever used bar none. Vanilla mechanics surpass it in almost every way. I'm sure it has its place in packs like sevtech ages or something, but... def not my cup of tea at all in any way. I'll avoid anything with it in the future. I tried the assembly halo and worktable in 3.5.0, and both don't work well with non-vanilla or staged items, not sure which one. When right-clicking on a recipe memorized by the halo, the recipe just clears and that's it. The worktable won't craft any staged item. It appears it crafted, but if I close and reopen my inventory, everything undoes and nothing gets crafted. The worktable also cannot memorize any staged recipe. I know there was a bug in an earlier 3.4 version of the pack preventing nearly all AE2 auto-crafting to work, so I'm concerned this bug extends to any auto-crafting and is back again. Anybody got success with AE2 auto-crafting since 3.5.0? I still didn't reach AE2, but if I'll try in a test world if I cannot find any evidence it works or not, because it's kind of a show stopper for me if I have no chance to get AE2 auto-crafting in this pack. It's likely this pack, which is a couple of months old, will receive less updates. I am more and more sorry to notice that absolutely no auto-crafting is possible on this pack for any staged recipe. All autocrafting blocks react differently. Some don't craft, some destroy the crafting materials, some seem to craft but this i sjust an on-screen display. 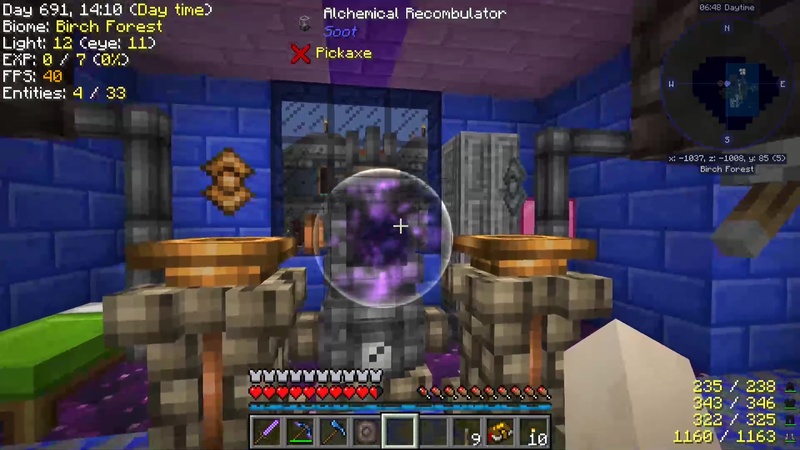 More and more concerned about this issue, I tried in a test world to cheat a minimal AE2 system with auto-crafting, and I was able to auto-craft a Machine Frame, which is a staged recipe. So AE2 still correctly works around the RecipeStages mod. But all pre-AE2 auto-crafting a Itried so far fails. Hi, anybody was able to go through the Power of Stars chapter of the pack, version 3.5.0. The constellation discovery just does NOT work. The looking glass and telescope show a bunch of stars, but they are constantly appearing and disappearing. Anything can be linked together to form what looks like a valid constellation, but the mod doesn't detect them, so I cannot "discover" any constellation. After a couple of minutes, it is day time again and I have to wait ten minutes until I can try again. This is not a problem per se, as I could skip that part of the mod, but the questbook makes it mandatory to find at least one constellation to attune to it, in order to get the constellation papers for the minor constellations. This is a real non sense. I tried for at least five nights, without any success. I know about a ritual from Blood Magic that could make it nighttime, but Blood Magic is locked behind Astral Sorcery. When doing Astral Sorcery, I strongly suggest ignoring the looking glass and using the telescope. Then, have the constellation in your shield hand, (refer to it often) you are looking for the constellations and then need to draw them on the screen like a connect the dots game. the sequence does not matter, but accuracy matters. They are sometimes hard to spot, but the stars that matter are larger than the rest of the stars by almost double. after you successfully draw the constellation, it stays lit in the sky. My question: How are we supposed to get VIS crystals? I was able to find 2 types in the Spectre dimension, but have found none since. we need ALL 6 to craft the Thaumometer. Wow... that was tricky... or maybe I'm just dense... the crystals you have to life infuse (air, fire, etc.) have to placed in the world on stone/cobble then broken for the Vis crystals. For someone that knows little about Thaumcraft 6, this was not intuitive. Please add a paragraph to "Elemental Crystals #742" explaining this... and I also recommend you bump the yield to 3 for that life infusion. Doing 12 (9heart) life infusions along with the AS and Botania bits is a bit of a steep climb just to open the door to Thaumcraft (2 sales Mundis and the base 6 for the crafting bench), doing 6 to cover those and have room to maneuver from the start feels less daunting. Additionally, once you place the crystal down, there is a CHANCE over time that they will "grow". if you break them right away you will only get a single Vis shard, they can expand up to 4 crystals if you are lucky (count them on one surface). so placing them and waiting is a good strategy. I just found this pack today and am coming up to speed. I like to run dynmap and forge essentials on my server. I mostly use forge essentials for world border/fill, permissions, backups, and chat logging. The FTB urilities have a pretty great backup system so I switched to that today. I also am using the FTB launch script that comes with continuum (and other new packs I’m sure). I’m using it for the auto restart. I also modified it to pop the files onto/off of a RAM drive. Anyway, that’s just some context. I’m having an issue where players don’t have permissions to many commands they should. Things like /island. I noticed it pop up twice in a questbook claim too (the first thing I did in the server). I’m convinced this has to do with forge essentials permissions plugin. I don’t know what the island command does and so I don’t know what permissions it needs. Is there a good list of permissions that all players need to have? Also is there a permission management framework in this modpack? I can migrate to that instead of using forge essentials. Edit: Ah it appears FTBUtilities has a permissions system. I’m sure having two on one server would complicate things. So really the only thing missing from FTBUtilities is worldborder. The reason I like worldborder is to pregen the map to lessen the server performance hit on exploration and to flesh out the dynmap. I don’t think that’s much of a concern for something like skyblock so I’ll just ditch forge essentials. I'm still blocked with Astral Sorcery. Somehow, discovered constellations reset and now the sky only shows parts of constallations. Many pages showed by the telescope have no stars brighter than the others, and the others have stars forming part of a constellation, but there is always something missing. It takes me more than 5 minutes figuring this out, so I don't have enough time to get anything discovered until day time, and then I have to wait 15 minutes before I can try again. This is excessively frustrating, because no matter how hard I try, it fails, and I already discovered two constellations which don't show up anymore in the sky. The problem is that the pack makes this mandatory in staged and gated modes in order to reach Thaumcraft. Blood Magic would also help, providing a ritual that makes it night time, but access to Blood Magic is also gated by Astral Sorcery. 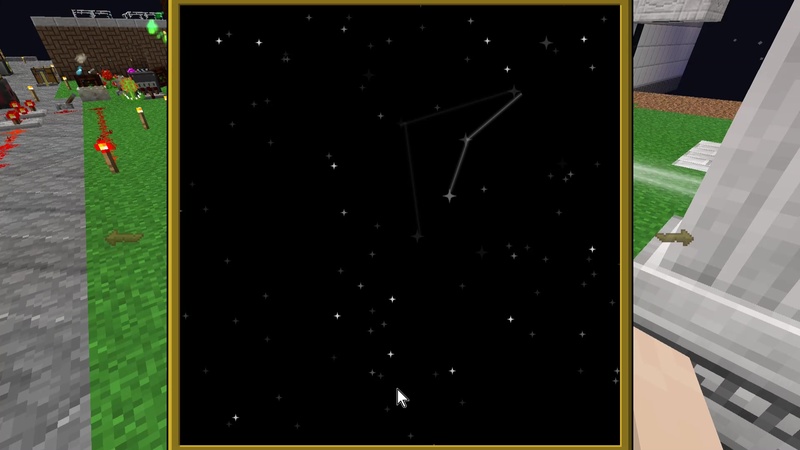 Attaching images of partially present constellation, and sky without any special stars. This doesn't work at all. The mod offers absolutely no clue to figure out what constellation is in there. The mouse pointer doesn't snap anywhere, forcing me to restart, restart, restart, and I cannot find any complete constellation. I'm starting to think that even though I'm not attuned yet, the telescope shows all minor constellations, and that completely blows my mind. I cannot remember the patterns of the four major constellation so I'm always mixed up and cannot find out what the points are suposed to link. That thus stops my progression there. I understand now that expert-style modpacks are not for me but this is the hard and very frustrating way. Hi again, after logging out and back in, the two previously discovered constellations reappeared so I was able to attune, get the minor constellation papers (from loot bags) and create the ritual pedestal and anchor, completing the Astral Sorcery chapter. The difficulty to discover additional constellation will prevent me from choosing what my player will be attuned to and to experiment with rituals and attuned wands, but at least I'm not blocked anymore in the progression. Hey, sorry if this is the wrong place to ask, but my sky resources guide is showing in the glyph alphabet now for some reason. I can't progress past the basic resource stage without being able to read the documentation. Is there any way to reverse this?